After performing for 55,000 people at Auckland’s Western Springs five years ago, the Rap God performed for a crowd of 46,474 at Westpac Stadium in Wellington last night. I know a few people were shocked that the show wasn’t in Auckland, but to be honest, I’m glad Wellington had the opportunity to host this epic event. I hadn't been to a show at Westpac Stadium in a while, and I really hope they are able to host more concerts in the future. I couldn't fault the experience. Opening acts for the night included DJ Sirvere, Shady Records signee Boogie, Bad Meets Evil artist Royce da 5’9, and Australian hip-hop heavyweights Hilltop Hoods. After releasing his debut album in January, Boogie was well-received by the crowd. The crowd didn’t need to wait long for Royce da 5’9 to hit the stage. 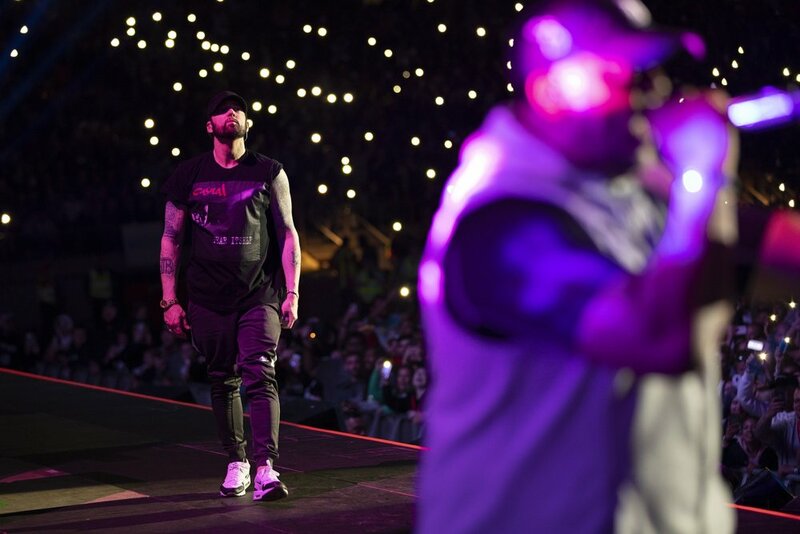 With full on energy and desire to give his all, Royce da 5’9” barely let up for a single second, getting every member of the mosh pit jumping up and down during performances of ‘Summer On Lock’, and Bad Meets Evil’s 2011 anthem, ‘Lighters’. As the evening continued, Hilltop Hoods took to the stage. I personally liked how they had three brass players join the group during the performance. It was refreshing. It didn’t seem like the crowd knew who they were, but it made no difference. The crowd was getting into the group and I’m sure Hilltop Hoods made a few new fans last night. They also brought out Adelaide artist Adrian Eagle for two tracks. While waiting for the Rap God to appear on stage, hits like Hail Mary, Nice For What, and Big Bank kept the crowd hype. The lights went out, and you knew something special was about to happen. Bursting on stage with full energy, Marshall kicked off the show with The Greatest, from the album Kamikaze. There is a reason why Eminem is the Rap God. Through a rapid-fire set of 32 tracks from old to new albums, including everything from Slim Shady classic Kill You to the skillful rapping on more recent hit Majesty with Nicki Minaj, Eminem showed why he will always be one of the best. During the night, Shady was joined on stage by Skylar Grey to perform the hits Walk On Water, Stan, Love The Way You Lie, and Monster. Her vocals were amazing. Fans were also in luck when Boogie and Royce da 5’9 appeared for a number of tracks with Em. Growing up listening to Eminem, it was definitely a highlight for me to hear The Real Slim Shady, Without Me, and Lose Yourself live, and I’m pretty sure 46,474 people agree with me. It was also a bonus to hear “Like Toy Soldiers” live.